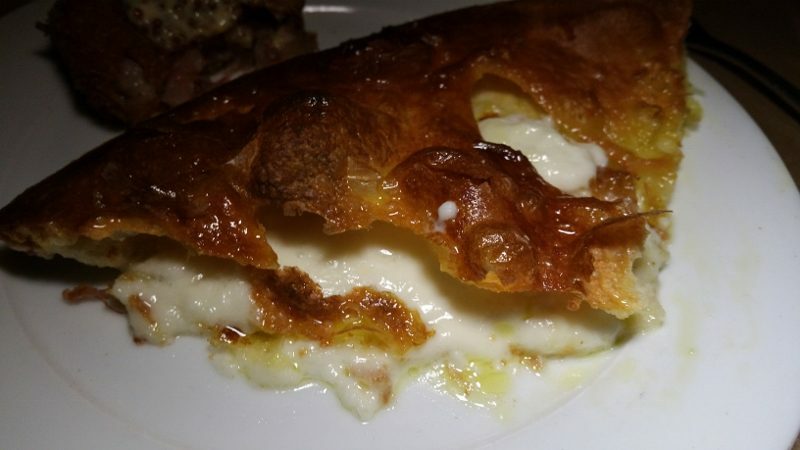 A little further down is a door to Mozza-To-Go. 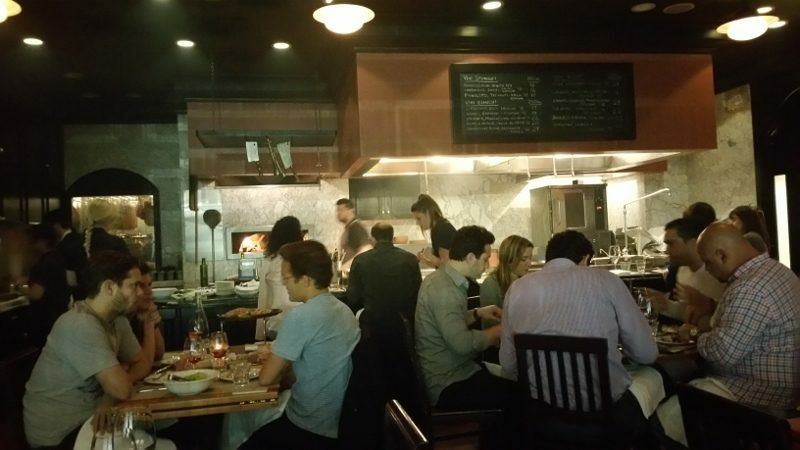 Enter Mozza-To-Go and then through another door and you come to the intimate Chi Spacca with the open kitchen. Tables are rather close so you have to maneuver yourself through the space to your table. We had a lovely little table next to the window but throughout our meal at least three different passers-by on the street stuck their heads into the small square to look into the restaurant and ended up giving us a little shock. Our friendly young server came immediately to the table to take our water order. As she poured the water, she proceeded to describe the menu to us. I was impressed with how well she knew each dish and the detailed descriptions she provided. You could tell she really likes and understands food. As I listened to her describe the dishes, I got hungrier and hungrier. We placed our order and then looked at the wine list. At first glance, I saw the word Bollicine (Bubbles) in the top left corner and then glass/bottle. I continued to look at the list and saw that the white wines seemed to be $14-$29 each and the red wines were $14-250 each. 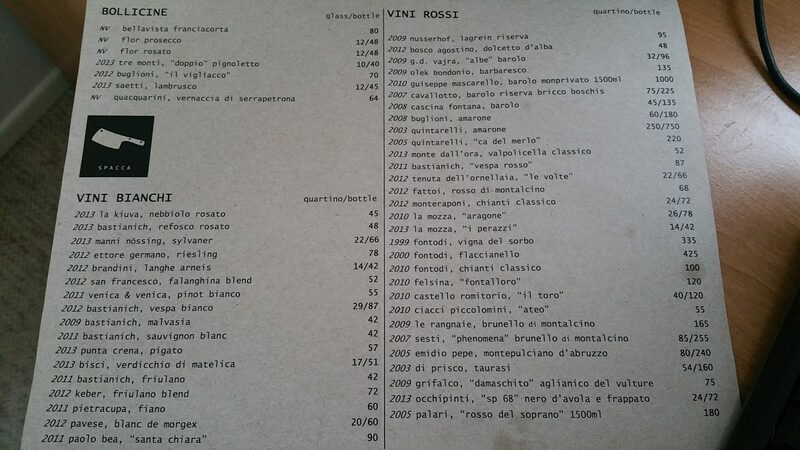 I had a moment of shock at these prices and our lovely server was quick to point out that unlike the bubbles, the white and red wine are served quartino or bottle. Now the prices made much more sense! 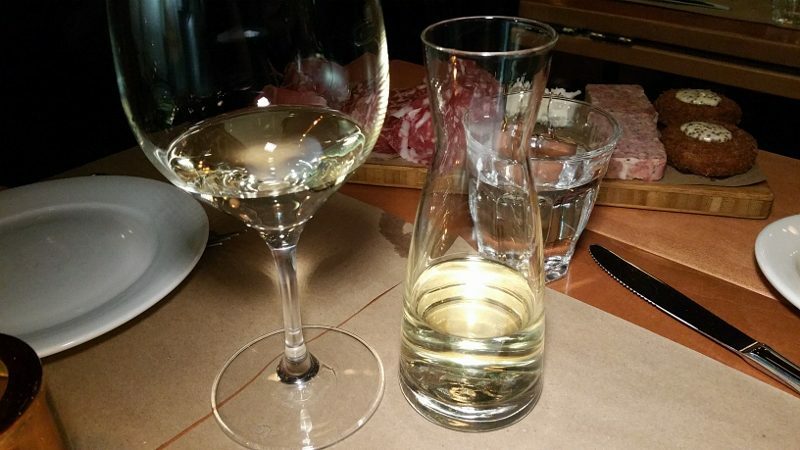 For two people, the quartino is the perfect size as we were able to order both a white wine and a red wine and in total have just over two glasses each. 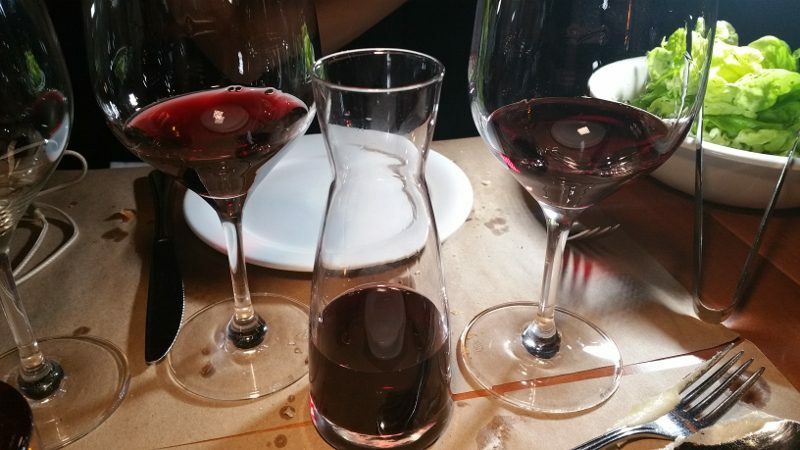 We started with the Bisci 2013 Verdicchio di Matelica and then ordered the G.D. Vajra 2009 “Albe” Barolo. 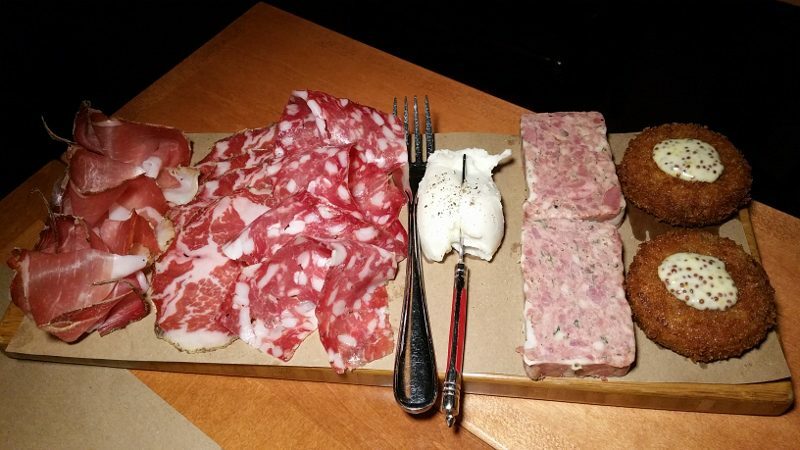 Chi Spacca is famous for its meat, especially Chef Chad Colby’s homemade salume so we ordered the Affettati Misti ($28) which is a sampling of all of the options. We got speck, coppa, oregano salame, lardo montecato, butcher’s pate and trotter fritti. As tasty as it was, the two of us could not finish it all. 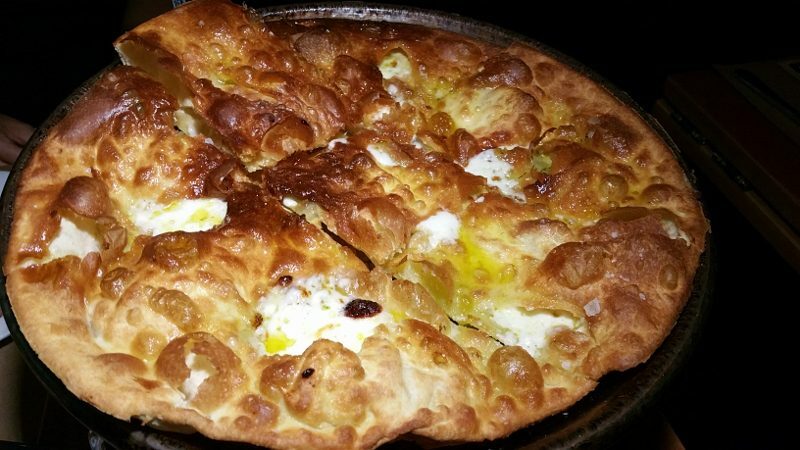 The Foccacia di Recco with stracchino and olive oil ($18) is outstanding! It comes out like a pizza and is thin layers of dough (there is no yeast) with melted stretchy cheese, olive oil and salt. So simple and so incredible! Again, it was too big to finish for two of us (knowing what else we ordered) but we sure tried. I would be happy to come back just to eat one of these with a side salad. When it comes to the meat, which they are known for, the portions are big and the prices are even bigger. The Costata alla Fiorentian is $150 (36oz) and $175 (42oz) and the Bistecca Fiorentina is $210 (50oz). These prices and portions are not for a small party of two. 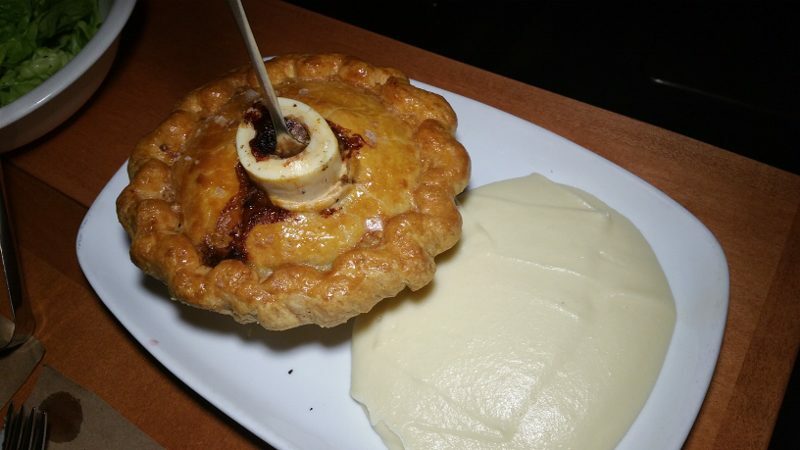 We went with the much-talked about Bone Marrow Pie ($48). Based on presentation, I understand why is it talked about. While the pie is tasty, it wasn’t life altering. The crust is thick and could have been flakier. The inside was rich and flavorful. And, the marrow was exquisite. 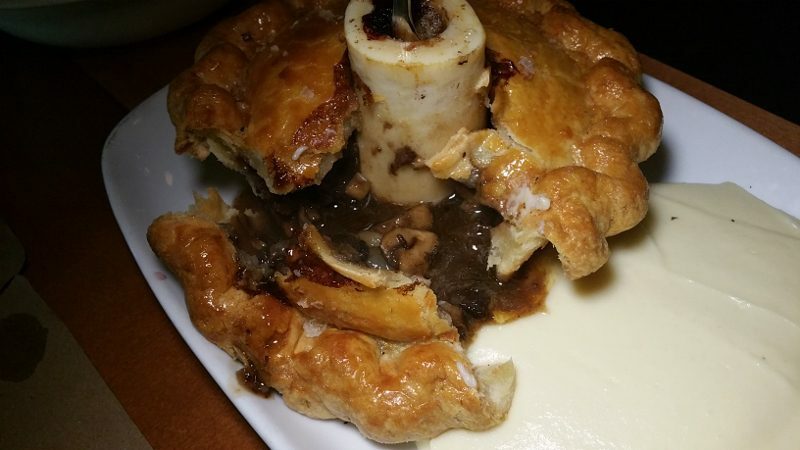 But, I don’t see how the marrow worked with the beef cheek pie, other than for the presentation. To me, they were two separate items and while they didn’t conflict, I don’t know how they enhanced each other. It’s like a doing a food and wine pairing. When it really works, the wine and food compliment and enhance each other. Other times they fight each other. But in most occasions they are both enjoyable but don’t do anything for each other. 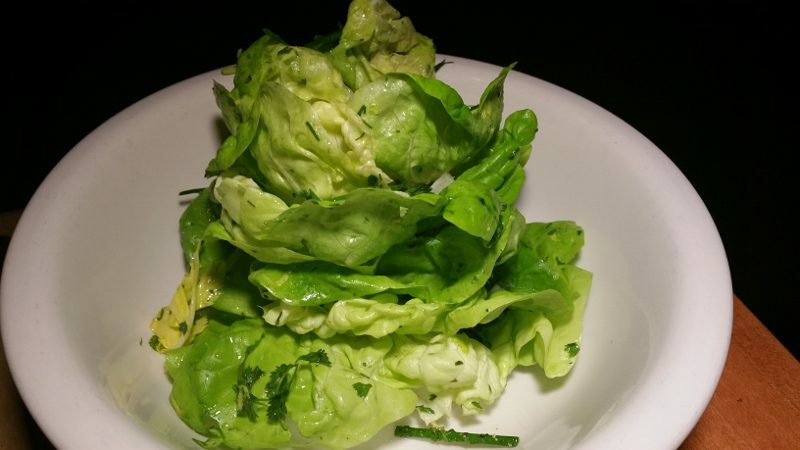 Although they looked good, we didn’t have room for any of the Contorni (vegetables) but we did order the Butter Lettuces with fine herbs and lemon vinaigrette ($12). This salad is fresh and light and a perfect accompaniment with the heavy dish. 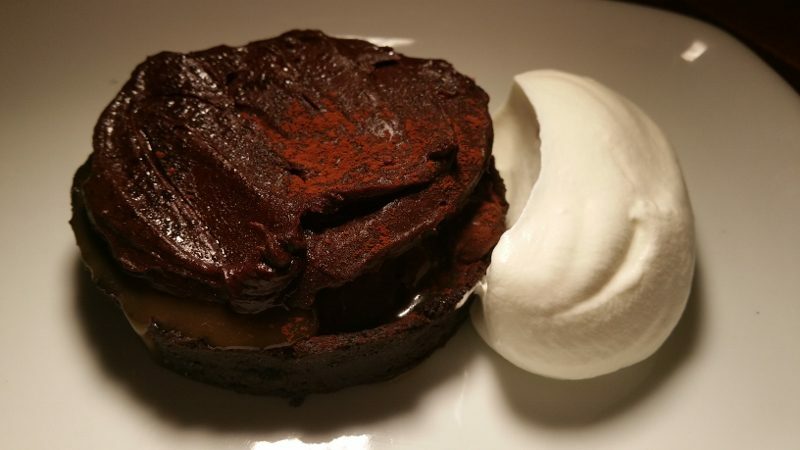 I managed to make a little room for the Cocoa Nib Caramel Tart with whipped creme fraiche but I was so full that it was hard to fully enjoy the dark chocolate dessert. I walked out of the restaurant with a full belly but also a stuffed nose due to all of the smoke that penetrated the restaurant from the kitchen. While I digested the food and my nose was cleared by the time I got home, the restaurant was still with me as my clothes reeked of smoke. A trip to the dry cleaner was the first thing on the list for the next day. If you head to Chi Spacca, a few tips: 1) go hungry, 2) go with a group of hungry people and 3) be ready to smell like smoke. 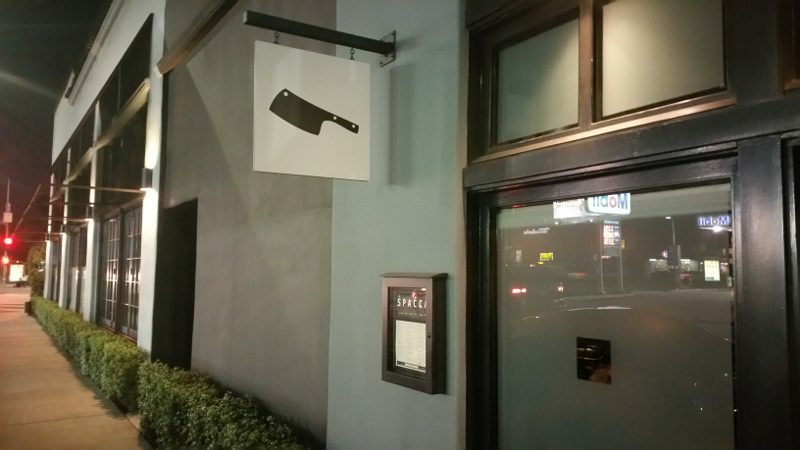 This entry was posted in Food, Wine and tagged Affettati Misti, Chef Chad Colby, Chi Spacca, Foccacia di Recco, G.D. Vajra, Hollywood, italian food, Los Angeles, meat, Melrose Ave, Mozza, restaurant by Allison Levine.